Lucky Lindy we dug you as a flyboy, but what’s the deal with all the chicks ? OK, we can give the nod to Charles Lindbergh as the first flyboy who flew solo from New York to Paris (has Jimmy Stewart ever been finer? ), but the whole America First Committee (AFC) thing, where as the chief spokesman, he campaigned to keep the United States out of World War 2 and was branded an anti-semite for statements he made on behalf of that cause (” The Jews are a race with undue influence in the media, warning that the passions and prejudices of such ” other people” would lead the country to ruin.”) We knew then that there was something dark, twisted, and acheiving a high mark on the weirdo meter, behind his big blues. He was a supporter of racial purity and a staunch eugenicist, which is someone who believes in the improvement of the human species through control of hereditary factors in mating. Lindbergh’s knowledge of this came from breeding animals on the farms of Minnesota. More black marks on his resume – he never really retracted his groove of Nazi Germany in the 1930’s and made public the invincibilities of the Nazis and their value as a bulwark against the hated Russians, who he regarded as a much greater evil. Lindy’s private life was no day at the beach, most of which was his own doing. 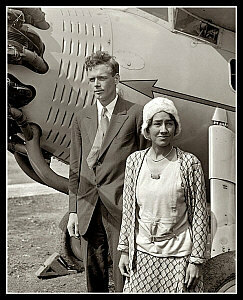 He married Anne Morrow, daughter of the U.S. Ambassador to Mexico, and stayed married for 45 years. Towards his own family Lindbergh could be cruel, locking his 18 month old son out of the house to foster independence and forbidding his wife to cry when the baby was famously kidnapped and murdered a few months later. Anne was a very accomplished author and a champion of women’s flight but Lindy was ” physically and emotionally absent” and was a control freak of the highest degree. Needing someone to tell her she was a groove, Anne entered into an affair with her own physician who provided support and fun – something that Charlie was never good at. Lindbergh’s real weirdness emerged when after he died of cancer, it was revealed that in addition to his five kids he had with Anne, Charlie had not one, not two, but three separate families living in Germany and Switzerland from which he had 7 more kids. All were perfectly concealed until after he was gone. The three lovers bore him 7 kids between the years 1958 and 1967. The children recall a tender father who always arrived in a Volkswagon beetle wearing a beret (was it raspberry in color ?) Their mothers told the children that their father was a famous writer from the United States who had been trusted with a secret mission and they should never speak of him. Their birth certificates declare “father unknown”. No wonder that the very popular dance ” The Lindy Hop” was named for Charlie. Then in 1972 , at age 72 , the ” Lone Eagle” crashed to earth, dying of lymphatic cancer at his home in Maui, Hawaii. Always the control freak, he specified the exact dimensions and constructions of his grave (” Father was obsessed with drainage” said son Jon.) (Aren’t we all?) He wanted his body wrapped in all cotton sheets, but had to settle on a cotton- polyester blend (all they had at the local store – don’t you hate that). Only his wife Anne was allowed to sit at his deathbed when” Lucky Lindy ” exhaled his last breath and only then by instructions could she kiss him. He hated to be touched. 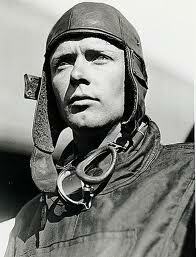 Charlie Lindbergh was an excellent flyer, but a flawed man who was a cold customer with deep rooted weirdness. Maybe he is guy who could fly you out of a sky full of trouble, but let’s not call Charlie for the good times. Groove. Scott Berg is a wonderful writer. In addition to his book about Lindbergh, he has written biographies of Max Perkins, Samuel Goldwyn, and Kate Hepburn. He is a graduate of Palisades High School, 1967, est.